Members of the Southern Bronx River Watershed Alliance hold a press conference about the Hunts Point Interstate Access Improvement Project at The Point's Riverside Campus for Arts an the Environment on March 26, 2018. 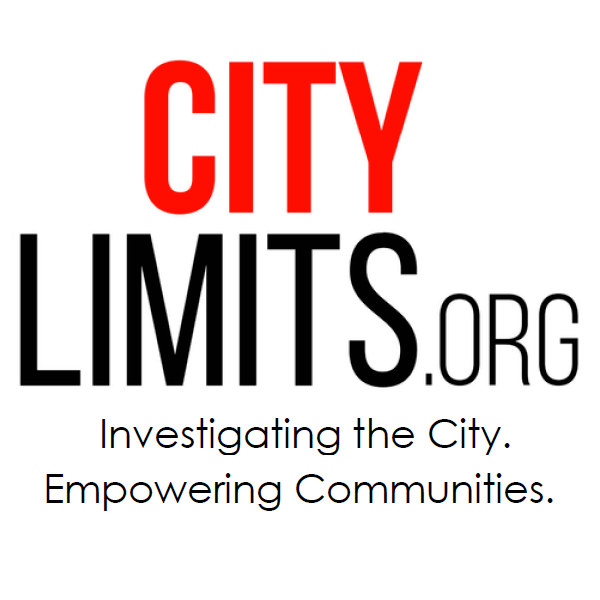 Welcome to Hunts Point, a neighborhood in the South Bronx crisscrossed by the highways of Robert Moses, with the third highest asthma rates in the city and the highest rate of adults who go without needed medical care among the city’s community districts. At the top of the hill are the roaring Bruckner and Sheridan Expressways, street vendors selling fruit in the shadows of the overpass, and a residential neighborhood brimming with life. But descend the hill and the neighborhood transitions suddenly from residential to industrial, with wholesale food warehouses and auto-body shops. At the bottom, between Edgewater Road and the Bronx River, are the businesses that rely on the water: a cement supplier and scrap metal company, among others. An outsider might not see much of a problem with siting a new highway ramp down here. That’s what the State Department of Transportation has proposed to do as part of an effort to remove truck traffic from residential streets while improving access for trucks getting off the Sheridan Bruckner Expressways that are heading to and from the Hunts Point Food Distribution Center. Local groups disagree. They say Edgewater Road is the central vein of an area where they have long been working—with success—to increase park and access to the Bronx River. They say the new ramps would cause pollution that would affect the nearby residential area as well as impact access to three parks in the area and a fourth park in planning, an elementary school and the community space adjacent to Hunts Point Riverside Park that is shared by the nonprofits Rocking the Boat and The Point Community Development Corporation. The space is a haven for local youth seeking a relationship to the waterfront, who come down from their apartments to learn how to build boats—and to ride them on the Bronx River—or to engage in urban farming and other youth programming. A map of the neighborhood created by SBRWA. 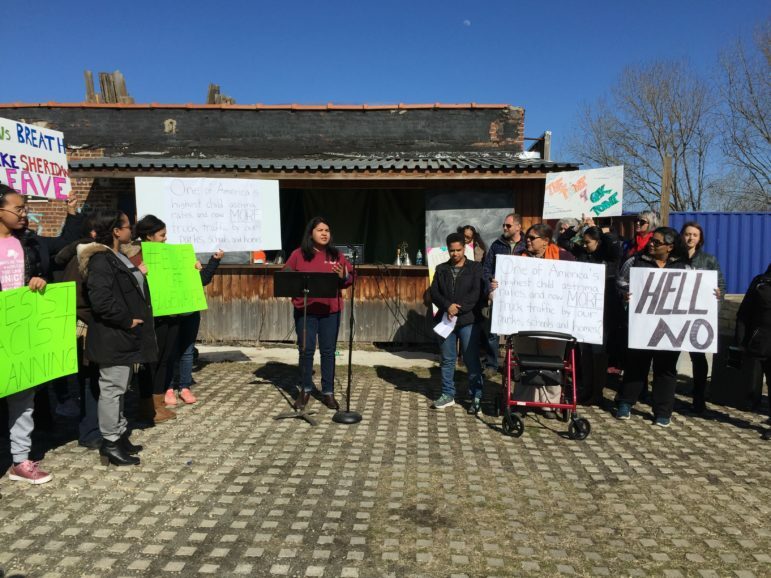 On Monday, a coalition of community groups called the Southern Bronx River Watershed Alliance (SBRWA) gathered at this spot to express their concern with the state’s vision. SBRWA shares the goal of rerouting traffic to prevent trucks from winding down residential streets and has long called for the conversion of the Sheridan Expressway into a tree-lined boulevard. They were pleased when Governor Cuomo announced in the spring of 2017 that the state would invest $1.8 billion to realize such improvements. But they expressed some concerns during the summer when the State Department of Transportation appeared to favor placing ramps on Edgewater Road and Leggett Avenue. And now, they’re increasingly worried—because the state recently announced that it would no longer be studying any other option except the state’s preferred one. At the least, the group is demanding that an option they favor, one proposed by the city in 2013 and which would place ramps farther from residential areas, is studied thoroughly. A comparison of the state's vision and the one favored by SBRWA (an image created by SBRWA). “I don’t feel like people who’ve never stepped into my community should have the last and final say on what happens to us,” said Sharianna Davis, a youth activist, at the press conference. Some of the groups involved in the Southern Bronx River Watershed Alliance are also those participating in the Department of City Planning’s Southern Boulevard neighborhood study. Wanda Solomon of Mothers on the Move is concerned that study might lead to a rezoning that triggers rising rents and displacements in the surrounding community, and that improvements to the Sheridan Expressway might only hasten that trend. This makes it all the more important that the highway project serve the needs of the youth and families who have long lived in the area, she says. But the State Department of Transportation’s project scoping report says the coalition’s favored option for the ramps—on Leggett and Oak Point Avenues—is problematic for several reasons, including that it would limit access to Oak Point Rail Yard, have substantial negative impacts on the railroad operator CSX and Amtrak, negatively impact many local businesses along that route, require the acquisition of nine properties, would still have impacts on pedestrians, and would be less effective at providing various points of access to the Food Distribution Center. In addition, while the state believes its favored route would cost $1.7 billion and could be completed by 2025, it says the proposed method favored by the coalition would cost $1.93 billion and would take three years longer to complete. The scope also says that it’s going to reconstruct the intersection on Edgewater Road that leads to the Hunts Point Riverside Park campus to improve pedestrian safety. An image from the state Department of Transportation's project scoping report of the employee cars that already line Oak Points Road, demonstrating why, from the state's perspective, putting a ramp here is a bad idea that would result in a lot of traffic congestion. 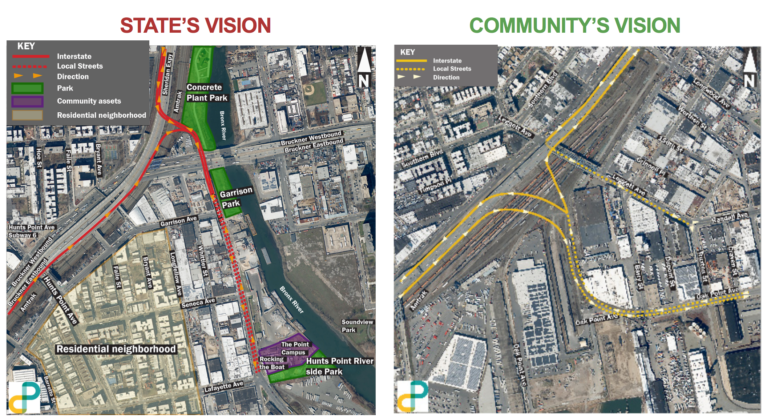 He adds that the state’s vision would reduce traffic on local streets and support businesses in the Hunts Point Market, include improvements to help the public access Garrison Park and create new overlooks of the Bronx River. However, Adam Green, the executive director of Rocking the Boat, says the state’s choice still could have potential negative impacts on a few businesses near Edgewater Road. The scope says this route will require the acquisition of five properties, as well as interfere with access to two businesses along Edgewater Road. Solomon says the coalition would like a meeting with the Governor so he can hear about the situation first-hand. The coalition will also continue to push the state to widen its study to include other options for the location of the ramp and will work to raise awareness about the project in the surrounding community. Any idiot can see the community’s vision is so much better on several levels. Solidarity! The community voice should be heard! The community’s plan looks so much better–keeping the truck route in an industrial area makes so much more sense than creating a new route right next to all the parks. Live here, work here, breathe here; then voice your opinion! Not only are the Oak Point ramps a better option, but the actual Sheridan Blvd the state proposes maintains all the excess capacity. The community plan for the actual Sheridan includes new space for parks and buildings. That aerial photo used in the “community vision” map is old. 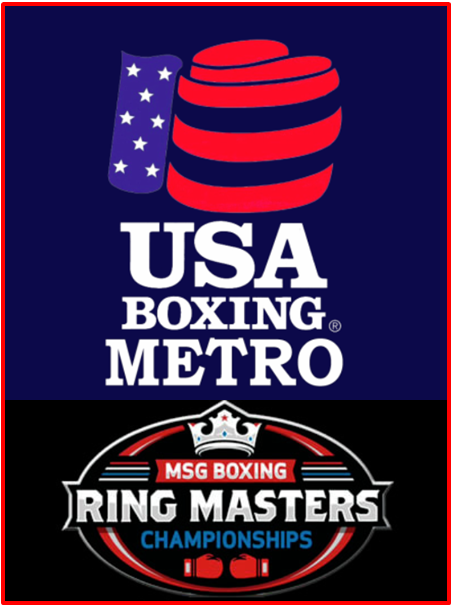 If you look at Google Maps, you will notice that there have been new developments in the area where Oak Point Avenue meets the railroad track corridor that leads up to the Bruckner Expressway. All of those large buildings would need to be torn down in order to create that sweeping turn that they propose to get the traffic onto Oak Point Avenue. In comparing both of these plans in Google Maps, it looks like the state’s plan is the more efficient way to get traffic to the expressways and to have fewer negative effects on the community beyond the single issue of park access. Rent-stabilized tenants made a lot of policy wins last year, but advocates say there’s still more the state and city could do to fight rent overcharges in rent-stabilized apartments. The city says it’s committed to maximizing the creation of affordable housing in East New York, but local advocates wonder whether its efforts are sufficient. 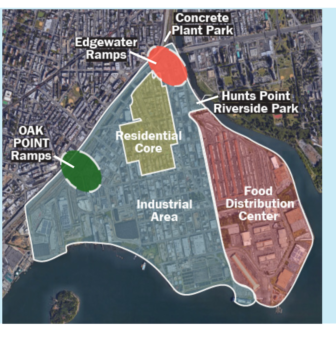 Industry and neighborhood advocates have concerns about the continuing conversion of industrial land to residential land, but the administration says it is carefully striking balance of ranging city priorities.